I just need to say that I absolutely love eating raw food! I am constantly blown away with how good you can make raw fruit and vegetables taste. This recipe is one that does not let me down. I had this for lunch today – my plate was piled high with salad, nothing else, and so was my partners (who usually leaves half his greens (excuse the pun)) – both our plates were empty in minutes… the food just tastes so amazingly good! With a few days off work I am going crazy – I have so many more delicious recipes on the go… I simply can’t wait for the days to go past so I can post more! Simply whisk together in a small bowl the dressing ingredients and set aside. 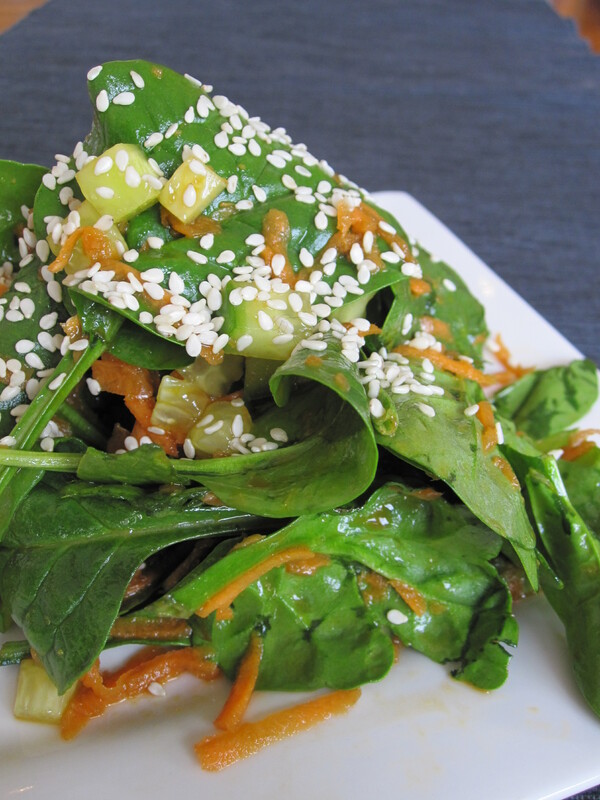 Serve onto plates and sprinkle with a Tsp of sesame seeds. I love having days off work so I can spend more time doing what I absolutely love to do – which is make yummy healthy food. Enjoy your salad and the many more amazing recipes to come!